Are you looking for an Andover fence contractor? Look no further than Arrow Fence! Our qualified professionals specialize in the art of installing a plethora of fence styles that will suit your every need. From wood or vinyl, to chain link or ornamental. Any of your residential fence desires can be done with the best around. Give us a call to speak with a professional Andover fence contractor today! Having the luxury of hiring experienced and local fence contractor is not something all home owners get to utilize. When you hire Arrow Fence you’re not just getting a beautiful white picket fence. We offer 50 years of experience through a family owned and operated business. Receive a free estimate, and if you decide to build your perfect fence you also are qualified for a 5-year warranty! When having work done around the home or office, hire a professional like us. There is no risk, with a great reward for years of enjoyment! Privacy Fence- Our privacy fence option limits the exposure of others on the outside. Keeping your children, pets, even yourself safe and protected is always a good option. Enjoy less noise after our highly qualified fence contractors are finished adding your brand new privacy fence! Ornamental Fence- A great way to secure your yard and be able to see out is by installing an ornamental fence. There are many different designs to suit your taste such as, sharp tipped, flat bar, artsy designs, and many more. Our durable products are made up of either aluminum or steel to complement the architectural look you are searching for! Wood Fence- When wanting a more natural look, a wood fence is the most popular option! We install cedar wood fences, privacy wood fences, decorative wood fences, and many other options to ensure you will find the exact fit for your property. Chain Link Fence – Function meets affordability with this fencing option. Installing a chain link fence is the solution many homeowners love. From classic black chain link fence to a completely unique construction. Our Andover Fence Contractors will deliver our absolute best. Picket Fence – There is little more traditional than a white picket fence. For years it has been the iconic symbol of a happy, comfortable home. Let us help you bring this dream to life. 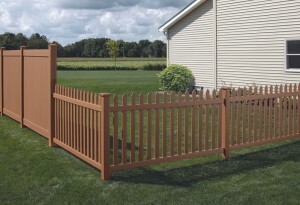 Vinyl Fence- The maintenance free vinyl fence is a great multi-color option for any look. Our heavy duty vinyl fences withstand the harshest weathers while maintaining a great look!